Who’s going to say no to a little beach dining? It’s so romantic that we know we can’t! Just imagine cozying up for dinner with your significant other enjoying tasty food and refreshing drinks while you dig your toes into the cool evening sand. Sounds absolutely terrible, doesn’t it? That’s why we’re on board with beach dining. We love the shabby chic idea of laying out a big blanket with a couple comfy pillows to help us relax and enjoy a meal on the beach. It’s the perfect time to take advantage of the long summer says and warm nights, but it does cool down so don’t forget to bring a sweater and a blanket! Just in case you needed extra motivation we’ve gathered and posted inspiring pictures to get you guys in the mood for some good old fashion summer romance on the beach! This week our Tuva-Luv comes from Wendy! One of her store favorites is the dash & albert jute ticking indigo woven rug! This rug is a natural, eco-friendly jute area rug. They provide instant style points and goes-with-anything stripes. The rug is 100% jute and is ready for any coastal home! Get a closer look at the dash & albert jute ticking indigo woven rug online now! If you like to find out more of our Tuva-Luvs you can check out the Tuva-Luvs page here! We love when a designer goes all white. It’s fresh, clean and looks beautiful. We also love pops of color in a space to give our eyes little treats to enjoy. So what happens when you take your blank white canvas and paint it with colorful accessories? Pure magic. The best way to show off your color choices is to cut out all the competition. When they don’t have to compete with other colors in the surrounding space they can really stand out. All white rooms, or rooms that are very neutral color based, give your colors a space to do what they do best – pop. So check out some of these spaces and see how these designers painted their canvases with colored accessories. 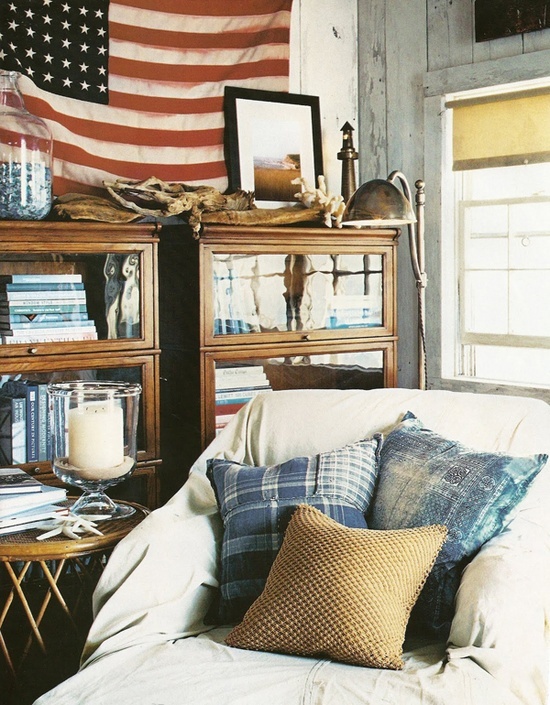 Come this 4th of July, decorate your home with style! There’s no need to go to the party supply store to grab anything and everything red, white or blue and plastered with little American Flags, because this year you are going to accessorize your home with the perfect touch of independence. We’re talking about decorating with red, white and blue accessories and flowers throughout the home. These little pops of color will act like fireworks on the Fourth of July! Plus you can use them again next year or even throughout the year instead of throwing everything out and buying everything over again next year. And don’t forget the pièce de résistance, that good ‘ol star spangled banner – the American Flag. This is one piece that can fly year-round and will always look good. Don’t be afraid to love your country and be patriotic! Enjoy yourself this 4th of July! Stay cool, use plenty of sun screen and enjoy the fireworks! Happy 4th of July! Tuvalu Home and Hobie Surf were honored at the Business Journal’s 18th annual Family-Owned Business Awards luncheon at Hotel Irvine last Wednesday. Tuvalu Home and Hobie were among the 2017 honored in the medium sized business class and were presented the award in front of 300+ people. A full profile will be available in the Business Journal’s June 26th edition. Check out the other nominees on the Business Journal’s page. This week our Tuva-Luv comes from Stephanie! One of her store favorites is the jamie young bandeau table lamp! This Jamie Young table lamp features a warm, wood base with natural grain details and a warm metal detail in the center. The lamp comes with a white linen shade has a beautiful burlap trim to balance the wood base. Shop the jamie young bandeau table lamp now! Find all of our Tuva-Luvs and more on the Tuva-Luv Page! It’s time to take advantage of one of summer’s perks – the sun. The sun is out and shining proud! So why not let that extra light into your home? Let it breathe fresh light into the space and let your rooms glow. Do you know what the best part is? The sun and natural light goes with every style and every home! Just open up those windows and let the sun shine in! We’ve got a few pictures for you guys to inspire your newly lit homes! Check out how these designers use the light to really let the space light up!